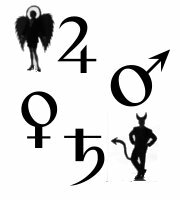 The planets in traditional western astrology (the sun, moon, Mercury, Venus, Mars, Jupiter and Saturn) all have their own natures, but are also categorised according to the kind of effects they most readily produce. In other words, those planets most easily bringing about nice things are benefic, and those most easily bringing difficulties are malefic. Opinion has always been split on which planet belongs in which category although, generally, Jupiter and Venus are benefics because they’re seen to be friends of life through their effects. Meanwhile, Saturn and Mars are malefics because their essential natures are damaging to life. Besides these, the moon is often considered benefic, the sun sometimes and Mercury wavers, too, because his nature is dependent on his company. What I mean is, if he’s with good planets, the matters which he symbolises ought to go well; if he’s with bad planets, there may be difficulties. The cause of the disagreement is that planetary matters are too complicated to call any a benefic or a malefic and leave it at that. One reason for this is that they’re symbols, or significators, naturally associated with certain things. Whether the signified has legs and can do well depends more on planetary strength than planetary goodness, and this is determined by things other than the planet itself. In other words, a well-placed and dignified Jupiter might symbolise a world leader, while a badly placed Jupiter might signify a school teacher instead. That is, the astrologer judges the strength of a planet in order to understand its scope as much as anything else. The idea of the planets as significators grew out of their "personalities," which were derived from the qualities of the seasons. For instance, Jupiter’s nature is moist, hot and airy, which is what ideal spring weather is like and what’s needed to make things grow. So Jupiter acts as a metaphor for things like temperance, honour, care of the poor etc., and associated occupations and events. The zodiac signs also took their qualities from the seasons. For instance, the spring sign Gemini is moist, hot and airy much like Jupiter. But, because spring weather is unpredictable, it’s changeable which Jupiter isn’t. This means Jupiter has gained a quality by his placement in Gemini, and an astrologer seeing him here as a significator might now predict a marriage with a changeable quality. They couldn’t predict a good marriage though, even with the benefic Jupiter as the significator. Another example: Jupiter in the winter sign, Capricorn, will be cooled and dried, and the planet’s natural airiness will be weighed down by Capricorn’s earthiness. This modification will mean that Jupiter won’t be so generous in his placement because the environment restricts his life-giving properties. He’s downgraded and instead of indicating a generous manager, maybe he’s now a careful one. Nevertheless, as with our Geminian marriage above, only time will tell how beneficial Jupiter’s contact in Capricorn is, although it’ll probably be a mixed bag of good and bad which can only be judged in retrospect. Therefore the planets are only benefic or malefic when it’s useful to think about them this way. The rest of the time they’re just what they are: Mars is just Mars, Jupiter is simply Jupiter, and both, along with all the others, are indifferent to what they bring about. Instead, the placement of a planet is mostly responsible for the feelings it evokes. In other words, in traditional astrology, the location and aspects of a planet are fundamental to their capacity for good. All placed in weak or unfortunate places will be less capable of producing effects, and it’s always down to us as individuals to use what free will we have to make the best of whatever hand we’ve been dealt. This article copyright © 2013 Helen Beers. All rights reserved. Reproduction without permission prohibited. Helen Beers spent many years trying to work out that actually all she wanted was to make a living from thinking about esoterica. Once she'd worked that out, she got a Master of Arts in Cultural Astrology and Astronomy from the University of Wales, Trinity Saint David. She's now an astrologer, tarot reader and dreamworker, whilst also blogging and posting fortnightly horoscopes at http://www.smilingsky.co.uk/.